Convert raw Amazon product URLs on your WordPress site into globalized and affiliated links! What is the Amazon Link Engine? Install the Amazon Link Engine. 2. After signing in, navigate to the Tools tab and create a new API token. 4. From here, find the Amazon Link Engine plugin, and click on Settings. (Note: be sure that the plugin is activated on your site first). 5. Once here, copy and paste the API Key and Secret tokens into the ALE. Step two should light up in blue and you will get a "Connected!" message. 7. If you're using a Custom Domain, you can select which domain you would like to use with the ALE. 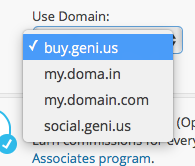 (Note: You will need to set up your custom domain with the Geniuslink Service prior to completing this step). 8. When you have Honor existing Associate IDs enabled, the plugin will use whatever Associate ID is hardcoded onto the original link itself, instead of your default affiliate settings. This feature will not prevent automatic affiliation for clicks from countries where that ID doesn't apply - if there's a US ID on the link, then it will be used instead of your default US ID. Clicks from other countries will use the IDs on your Affiliate page. This feature is useful if you were previously using per-article Associate IDs. 9. When you have Preserve URLs until click time enabled, your links will remain unconverted when the page loads, and only localize once a user clicks your links. This helps you stay Amazon compliant because the links continue to read 'Amazon.com' instead of 'buy.geni.us' (which would require some kind of disclaimer near each link). 10. Be sure to hit Save Changes and you are all done! 11. Your click data will now be flowing into your Geniuslink account. If you haven’t already, sign up for the Amazon Associates Programs you’d like to earn commissions from (instructions on how to sign up can be found here). Once approved for the various Amazon Associates programs, jump into your Geniuslink dashboard and navigate to the Affiliate page. Then, click the Connect an affiliate program button and paste in your ID. Select the appropriate country, then click save. Repeat with one ID for each marketplace you've signed up for. Once saved into the dashboard your links will start using the appropriate affiliate parameters with each click. Click here to learn more and download the Amazon Link Engine Plugin.